I grew up in a really big family (13 kids!) on a dairy farm in Southwest Wisconsin. I had 5 older brothers. Needless to say, my parents were happy that I was a girl. When Mom was sewing (mostly patching clothes for all those boys), she would give me a needle and thread and a big can of buttons. I'd make really long strings of buttons. Mom was so busy with all of us that we never realized how creative she was until many years later when she had time to pursue ceramics and quilting. I can still remember getting a needlework kit for Christmas. I must have been about 8 and I thought it was about the greatest thing ever. I remember my sister, Barb, getting a Barbie doll and I thought I'd try to make some clothes for it. So I found some fabric scraps and fit them to the doll and sewed them together by hand. Mom thought if I could figure out how to make the waistline on a Barbie doll dress, I could learn to sew. Sisters Judy, Barb and Diane at Barb’s wedding. As soon as I was old enough, I joined 4H, just as my brothers had before me. We had a sewing leader who was just amazing. I really enjoyed the sewing lessons and soon was making many of my own clothes. I continued to do that all through high school, college and for many years after. 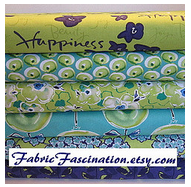 A sewing machine was one of my first purchases after I got my first real job. I also tried my hand at knitting, crocheting, macramé, cross stitch, crewel embroidery, candle wicking, decorative painting, rug hooking and any other handcrafts that came along. 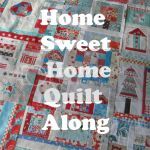 I always loved the look of quilts and when an all day workshop was offered through the Homemaker's organization in my county, I signed up. It opened up a whole new world for me. My Mom was learning to quilt at about the same time, and my sister, Barb, learned a few years later. One of Diane’s beautiful creations. I started selling some of my creations at area craft shows and, in November of 1992, hosted my first sale. It was in my garage and exceeded my wildest dreams. About this time, my husband, Frank, wanted to buy another piece of property and sold me on the idea when he promised to make a craft shop for me in the building on it. (My crafting was taking over our house and I think he wanted it back.) I had lots of room and decided to teach classes there. I offered single session classes where I provided all the materials and at the end of the evening, you went home with a finished item. My students really loved not having to shop for supplies or go home with something that would never get finished. 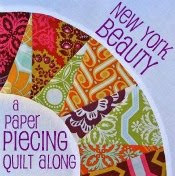 At this time, I also started to teach quilting. 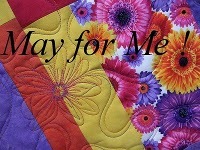 I started with a weekly Quilter's Workshop where everyone brought in their projects and I helped as needed. I went on to teach many beginners and specific projects. When some of my students said they'd like to try dyeing their own fabric, I checked out lots of books from the library and started experimenting. Now, almost every quilt I make includes at least some of my own hand-dyed fabric. In 2002, we sold my craft shop and Lapacek's Orchard became a much bigger operation. My quilting and crafting slowed down for a few years, but I was soon offered the opportunity to teach quilting and fabric dyeing at various events around the state including Quilts by Barb Quilt Retreat Getaway Weekends and Sewing and Quilting Expos in Fennimore and Oshkosh. 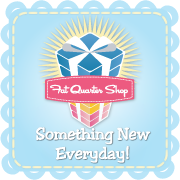 I love watching new quilters gain confidence and challenging more advanced quilters to try something outside their comfort zone. 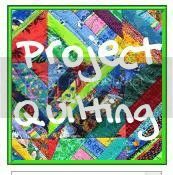 Read more about PROJECT QUILTING! 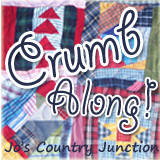 First Challenge goes up on this blog on Sunday, April 11th at Noon (CDT). Summer Beauty – just one of Diane’s amazing quilts. Many of her quilts are for sale at my website: www.kimscraftyapple.etsy.com. The descriptions clearly state which one’s Diane made. I hope you agree with me in saying that Diane is more than qualified to create our challenges. Monday Monday – theApple Makes Front Page!